I was interviewed by Layla Haidrani, writer for metro.co.uk, in November 2017 for this article on what to do when thinking about going freelance. 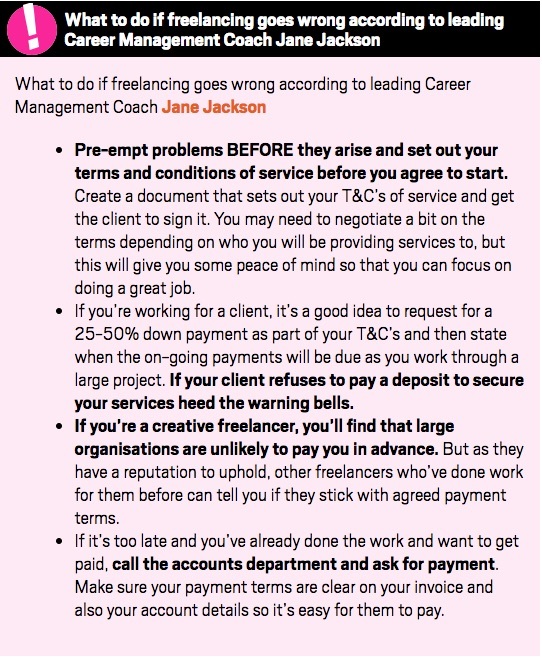 What to do if freelancing goes wrong according to leading Career Management Coach Jane Jackson. Pre-empt problems BEFORE they arise and set out your terms and conditions of service before you agree to start. Create a document that sets out your T&C’s of service and get the client to sign it. You may need to negotiate a bit on the terms depending on who you will be providing services to, but this will give you some peace of mind so that you can focus on doing a great job. If you’re working for a client, it’s a good idea to request for a 25-50% down payment as part of your T&C’s and then state when the on-going payments will be due as you work through a large project. If your client refuses to pay a deposit to secure your services heed the warning bells. If you’re a creative freelancer, you’ll find that large organisations are unlikely to pay you in advance. But as they have a reputation to uphold, other freelancers who’ve done work for them before can tell you if they stick with agreed payment terms. If it’s too late and you’ve already done the work and want to get paid, call the accounts department and ask for payment. Make sure your payment terms are clear on your invoice and also your account details so it’s easy for them to pay.